Very good visuals, even if it's a bit a one-trick pony. i favored the music but the visuals were a tad bland. I liked it otherwise but the flashing just seemed out of place so I didn't really care for that. Good work, and the musical editor is a nice bonus. Candy for my ears and eyes! New synth! The visuals maybe not so exciting, but I always like clean rendering. Clouds could have been a little bit more sophisticated though i.e. I usually like to add some non-uniform scaling/shearing to noise to make it look more smeared/cirrus-like. The visuals could have been a little bit better but I have to give a thumb up for the synth and making music using that "editor". Must have taken some time and patience. This brings memories of wishful twisting, only this one is solid and not particles. Really great work on the synth and the music fits really well. Overall a pretty great 4k! Congratulations! As some of you seem to have noticed, my focus was primarily on the synth. TBH, it's a tad too big for 4k (room for optimizations). 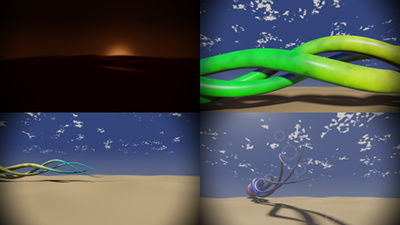 The visuals were mostly an exuse for me to learn ray marching and shading (spent some time on making it fast). Had to throw out FXAA, chromatic aberration and multiple shapes to reach 4k. page created in 0.020340 seconds with 15 queries.